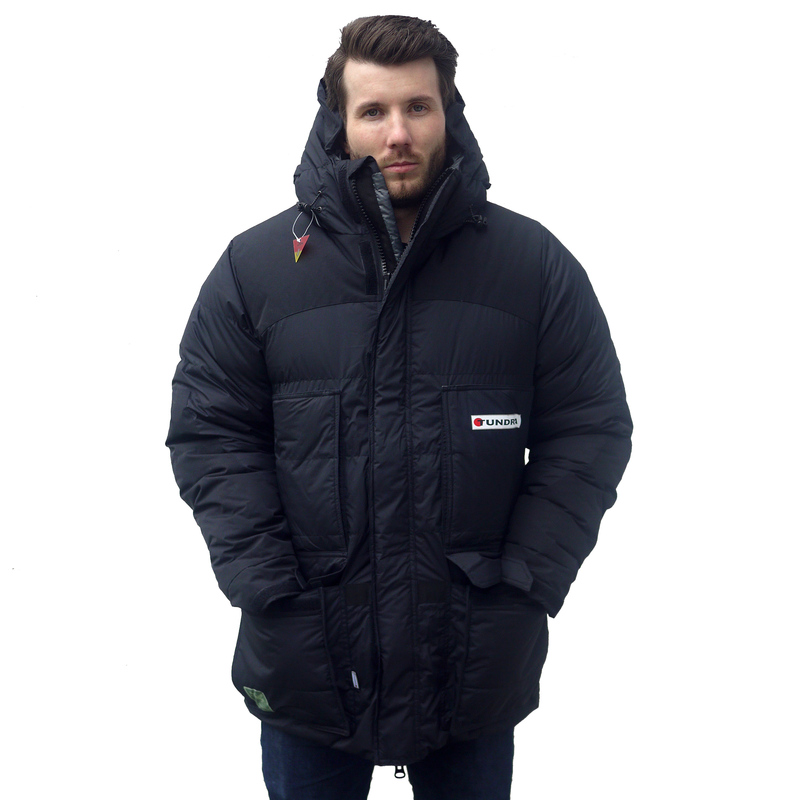 The unisex Arctic Jacket was designed for people working in extreme polar conditions. It would be particularly suitable for explorers, film crews and polar scientists. 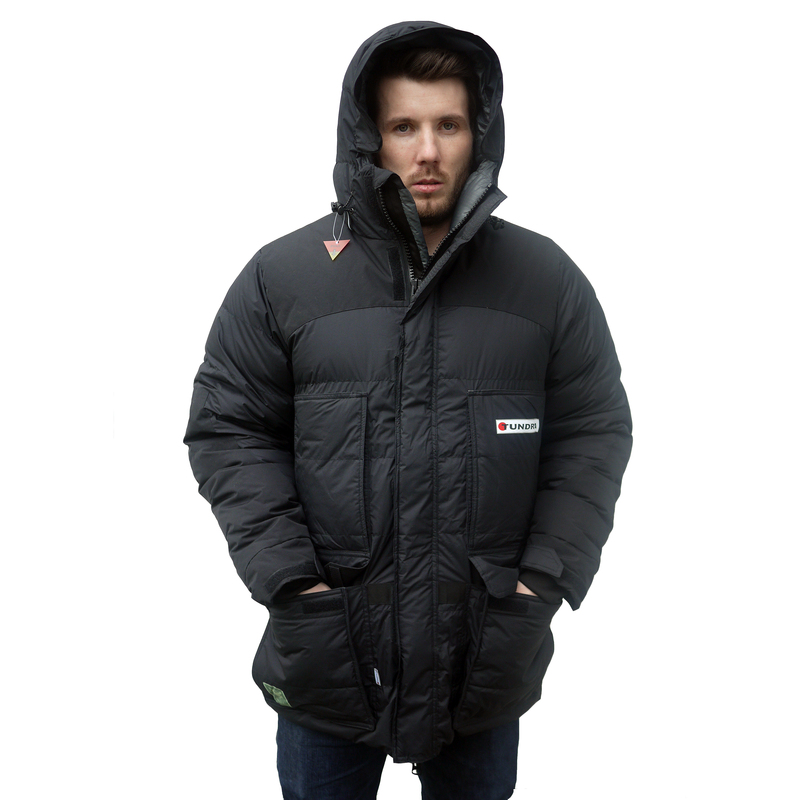 The down-filled jacket uses the same high quality 880 Fill Power (Euro Standard) ethical down that we use in all our sleeping bags. 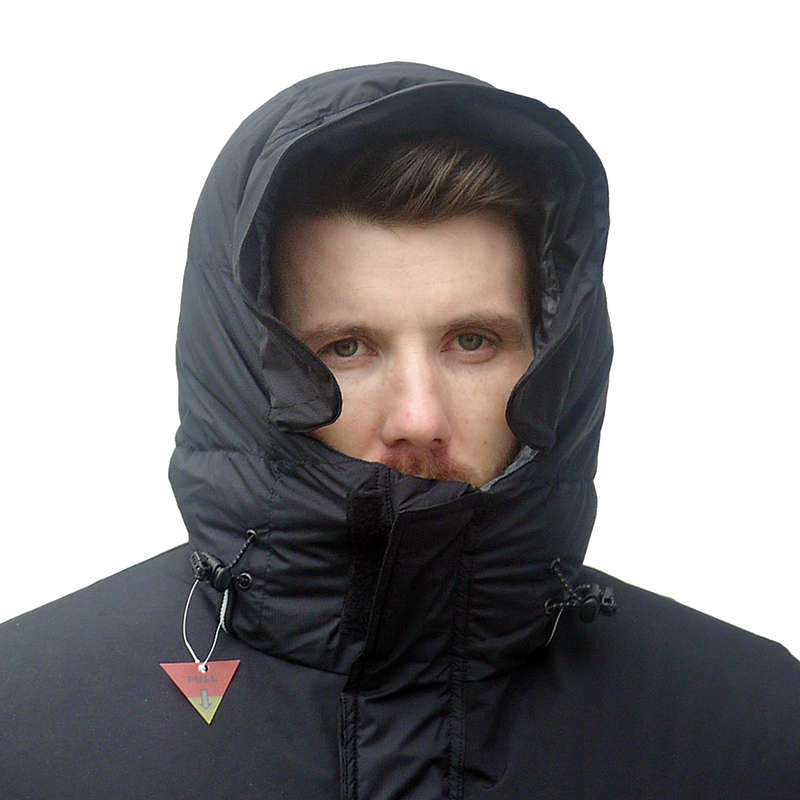 We don’t use fur around the hood, however its snorkel style makes it particularly warm and effective. The Arctic Jacket is made to order and can be specified with our without our Tundra branding. The jacket has many features to help you survive the tough life in the extremes including a full waterproof outer. Special order sizing available on request. Please contact us for more information. Matching Salopettes are also available. The hood of the jacket is designed to offer protection in severe conditions. It is snorkel shaped with a wire supported peak that can be clenched closed around goggles for protection from the wind. There are two draw cord systems to “close down” the hood; one runs around the front behind the peak to close the front opening and the other operates from the back and reduces the volume of the hood. The hood is sized so you can wear it over a helmet but if you are not using a helmet then you can reduce the volume for a snugger fit. The jacket features an interior chest pocket, a side entry chest pocket and front patch pockets with side zips to make them hand warmers. The front patch pockets and are reinforced on the top edge to stop the weight of your hands in the pockets ripping them off the body of the jacket. Texturised Nylon is used to provide extra wear and cut resistance. This Nylon is woven in a different pattern for strength as opposed to the regular ripstop nylon that is used in the body of the jacket. The texturised Nylon is used on the arms below the elbow and across the shoulders. ￼There is a heavy duty zipper under storm flap at the front of the jacket. ￼The inside of the jacket also incorporates a snow valance.